The end of another year and for many this brings about a time to reflect on the year that has been, and the new year to come. Memories of the awesome times. It is a time people often try to improve themselves, hence the idea of New Years Resolutions which personally I have never gotten into, but I still like to reflect on the year that has been and gone. 2015 was a year of change for us Trooprock Aussies. In 2014 we visited the USA for three months to play in the sky, jumping out of planes, where a great time was had by us both. Then it was off to United Kingdom with an Ancestry Visa for Cam, and a Working Holiday Visa for myself, the plan being to live there for 2-5 years. Needless to say we only lasted 2 months because we missed our beautiful country! We flew out of England on Christmas Day 2014 and after 40 hours of travel, including a 10 hour stopover in Singapore we were finally back in Australia on 27th December 2014. We kicked off 2015 with not much direction. I started a nannying job in the Hunter Valley, NSW. Having previously worked in Child Care, becoming a nanny is something I had wanted to try my hand at. I didn't particularly like it, but at least I can say I have tried. While I was doing this, Cameron started to work on his novel again that he started back in early 2013, the year we bought Rocky. After a few months of dedicated writing, the story was complete, but then came the gruelling task of editing, so more on the book in a moment. Rocky was due for rego in early March, so once that was sorted we were ready to be on the road again. For the second time we headed north. 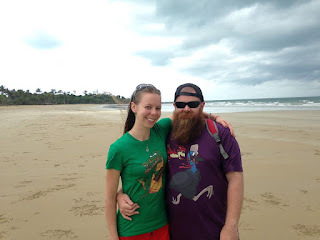 We spent about a month travelling, visiting relos, and avoiding caravan parks over the Easter period (which as usual in Australia was pouring down with rain anyway). Then back to travelling until May where we started work again as tour guides at a place called Paronella Park. It was a beautiful location to work in the rainforest, and so different in every aspect to when we were tour guiding in central Australia; green vs. red, 45 minute tours vs. 3-4 day tours. You can find more information about us on our tour guiding information page. In life it is good for the mind to vary things up a bit, to get away from the repetition. This was certainly Cameron's mindset this year. If what they say about keeping the mind busy helps prevent dementia then this year Cam has certainly kicked it as far away as possible. After the book was written, and in the process of being edited by an elite handful of people, including myself, Cam started another project. While working at Paronella Park we found some Australian based cartoons that he had drawn in the past so he decided to do something with them. He scanned them onto the computer, coloured them, then put them onto t-shirts, and started his first on-line business selling them. Talk about keeping busy! The brand is called Li'l Aussie Monsters. For me I have always had a collection of shirts with cartoons on them, but now I have some that have been drawn and created by the person I love. It is a proud moment for me when people compliment us on the shirts and I proudly tell them that Cameron created them. Over the years I have noticed that by the time September comes around people start commenting on how fast the year is going. Usually I just agree, but for us it did seem that 2015 has flown by! After being away for the past 2 years for Christmas we had promised family at the beginning of this year that we would be back in Newcastle and the Hunter for Christmas 2015. Working up north was good for this as the tourism season starts to dwindle by the end of October when Australian travellers start to head back down south. When we first started working we were told there would be work until October. By September we knew our time was drawing to a close and time to think about what would happen for the rest of the year. We finished up work in mid October after the school holidays. After changing hats from tour guide to tourist, we did a final lap up north then started heading down south again. We of course spent time at Townsville with mates and while we were there I caught up on some blog posts from the year, hence why there is 7 blog posts in October posted within a week! For 2016 we plan on bringing you much more frequent blog posts. It was also in Townsville that new beginnings were in the air. I was starting to think outside the box in regards to travellling and seeing Australia. I had recently read articles and blogs about people house and pet sitting for others while they go away. It is a good way to see different parts of the country. For us particularly as we are already seasoned travellers it seemed like a good idea and whilst between sits we could just do what we usually do and camp in Rocky. I reasearched a few different websites to go through to house sit and decided on Aussie House Sitters. I payed the yearly membership of $65 which is what 2 nights in a caravan park with power would usually cost us. The site is good in that you set up a profile with information about yourselves, and after house sits people can leave us a reference afterwards. For some people it may be hard to start as many people ask for references which is fair enough as they are leaving you in charge of their house and pet. Just like going for a job though, if you know people who can give you a character reference, most people are happy to accept this instead of a reference on the site. For us to get started I referred to this blog so that people could get more of an idea about who we are, and we have participated in couchsurfing for many years too, where we have hosted numerous travellers and gotten references off them. On the site we are free to select areas in Australia that interest us on where we would like to house sit. This is more for the people needing a sitter so they know if we are in the area or not. When we search for house sits though, we are free to look anywhere in Australia. After Townsville we continued heading south. Coming to the end of October, Cam's book was almost ready to publish! Due to some advice he decided to release the book online through Amazon. It allows us to travel without having to lug around the books, but that said Kindle and e-books are not as big in Australia just yet, fortunately you can order a physical copy of the book through Amazon USA which are printed on demand. Once the membersip for the house sitting was paid for I set up our profile; Jeni and Cameron (Trooprock Aussies). Our first house sit was 30 minutes north of Coffs Harbour at the end of November. This gave us the chance to visit and spend time with Cam's nan which we don't get to do very often, and seeing as it was approaching the Christmas season, we had a few early Christmas celebrations. It was a lovely time. Earlier in the year we promised our family that we would be in the Hunter Valley for Christmas, so after our first house sit was complete we came true of our promise and continued to head south. Well Christmas certainly was great, made even better that we got to have Christmas two days in a row! Cameron's sister had a gathering on Christmas Eve, then we visited my family on Chrismas day. It was great to see everybody, but it was also great to give our bellies a rest on Boxing day after all of the food that was consumed! We are finishing off the year and kickstarting the new one in Nelson Bay house sitting. Normally a place I would avoid this time of year as it seems to be tourist capital, where all the Sydneysiders travel 3 hours north for their family holiday, but we are house sitting enjoying the area and avoiding the crowds. The house is nice, the dogs are friendly, the weather has been hit & miss, but we are making the most of the sun when it is out. For us 2016 will be about using house sitting as a means of travel, and in between jobs we of course will go camping in some new place with Rocky. We are happy for short or long sits but our aim is to find a longer house sit of 3+ months in Victoria, South Australia or Western Australia. This will allow Cam to work on his second novel, and it is long enough time to find casual work in an area. If you are reading this blog post and need a house sitter please feel free to contact us through Aussie House Sitters. If you are reading this as a tour company, blog writing company, or travel company and like what you see, there are email links to contact us via our tour guiding page. From the Trooprock Aussies Cameron, Jeni and Rocky, we hope you had a merry Christmas, have a happy new year, and an icy cold beer! After the sun had well and truly gone down at the end of the first day of this adventure we ended up at Hat Head National Park. You'll need to drive down a few k's of dirt road to get there, which in my opinion, makes it all the better. The campground was pretty quiet with more roo's than people loitering the grounds. After a great nights sleep in Rocky we decided to walk through the scrub and find ourselves a beach. A beach we had all to ourselves, such is the benefit of going to a slightly remote beach during cold, wet, windy weather. After we had our fun on the remote beach we set back off down the dirt road to see the main beach in Hat Head. The people relaxing here seemed to be a much younger demographic than the places we had been the previous day. There's a quite little tidle inlet to the south, with a small breakwall leading it to the ocean. Waves were decent and seemed to come through in consistant predictable sets. 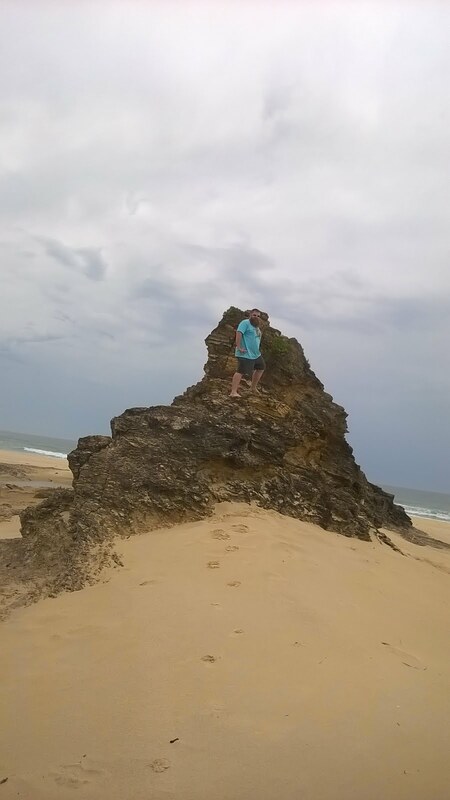 The first thing we did here was drive up the the headland where there is a great lookout. It gave us a spectacular view back north showing us the beach we had to ourselves earlier and a a lovely view over the national park to south. After that we head into the township and ate a mango, because that's what you do at Crescent Head. The main beach was filled with surfers and on the north side of the lagoon inlet was the most southern part of Hat Head National Park. The inlet was crystal clear, smooth and great for paddle boarders. The town was busy, but didn't feel too crowded. This is a pretty interesting little place where you can go and pick your own strawberries at $16 a kilo. We made sure we picked the best strawberries and they were awesome! They have a variety of tomato, strawberry and various other fruit and veg sauces and relishes. Here's a city with a beach, you can get all the things you need to stock up on from a city, whilst never being too far from a salty place for a swim. You'll find all walks of life living and holidaying here at Port Macquarie. Jeni had holidays with her family quite a bit when growing up and wanted to take me out to her favourite resturaunt from her younger days, The Pancake Place where we devoured some delicious Chocolate Indulgance pancakes! Another place close to Jen's heart. She adored the place when she was younger. We splashed out on a night at the local Big 4, always good to have a shower! Despite the weather still being too cold for swimming, Jeni reminisced on her younger days as we strolled along the beaches. 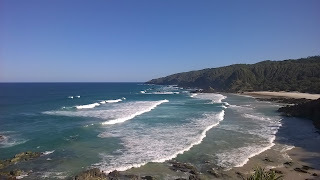 East of Laurieton, this is the most southern beach on the coastal loop south of Port Macquarie. Quite a relaxed beach with a breakwall and inlet leading to a lagoon full of oyster farms. Found on the south side of Camden Head, to get there by land you need to travel right into Laurieton and go across and around the lagoon. 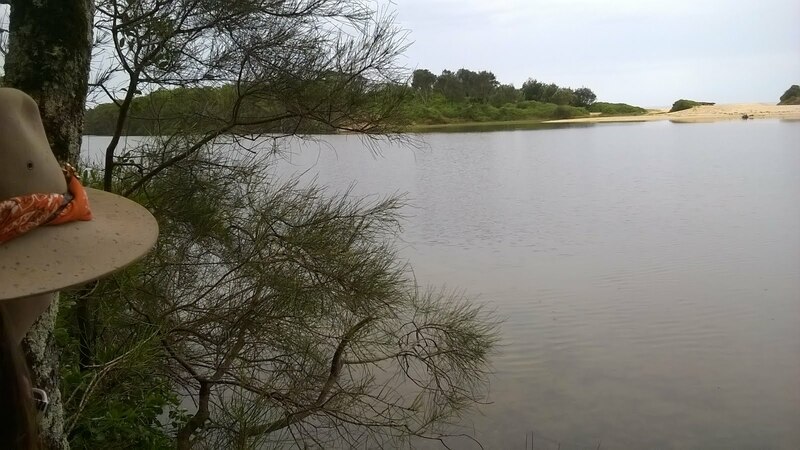 Kattang Nature Reserve leads you up to Camden Head Lookout. Upon our arrival the weather was on the verge of rain, birds were singing away and the smells from within the nature reserve were delightful. We strolled through to the lookout for a great view, but didn't stay too long as we could see another storm rolling in which made it to Rocky a few seconds before us! On our way to meet up with the Pacific Highway, we took a quick detour up North Brother Mountain. From up here we got spectacular views north all the way up to Port Macquarie and to south over Diamond Head and Crowdy Bay national parks. A top spot to stop for a lunch with a view! East of Taree you'll find Old Bar, a bit of a rustic beach town. The beach was quiet and nice. We were torn wether to go for a swim or not as we saw this thing we hadn't seen for a while called the sun, but the weather was still pretty chilly. Our favourite beach in Newcastle is Redhead, so seeing a Red Head suburb, we had to check it out! We pulled up near a nature reserve and strolled on down to the beach, which was not Red Head Beach, but Black Head Beach! A very pretty little beach, I believe a bit further south access to the beach would have been easier from the township of Black Head, where Red Head is more of a residential area. It does have a caravan park though which I didn't go into, but I'm sure would be excellent for accessing the beach. Now the sun had finally come out to play and start to warm things up, we finish our beach scouting adventure and get busy enjoying the sun! I hope this brief beach run down helps you find a nice new place to visit on your next holiday or weekend trip around the Mid North Coast of NSW. Hope you all have your Christmas shopping complete! Only a few days left before the big red beardy fella rocks up! There's many reasons people travel, to find themselves, to find something new, for a sense of adventure or while searching for something incredibly unique and personal. Different adventures can be for many different reasons. For me personally, one of the things I'm searching for when I travel around Australia is the perfect place for me to settle down. In the western world it is quite the norm to settle down first, adventure later. However if I am going to settle down and do grown up stuff, it's gotta be somewhere I really want to be. Somewhere that makes me smile day after day. I'm sure everyone has a different definition of the perfect place to settle down. Whenever I'm abroad, regardless how much I enjoy myself, I know in my heart Australia will always be home but figuring out that pinpoint spot I want to call home is taking a lot of scouting! Something Jen and I realised is much of the NSW coast we have yet to see! After our recent trip to Coffs Harbour we decided we'd check out as much of the coast and beaches between Coffs and Foster as we possibly could. We had to get back to the Hunter so packed all these beaches into 3 big beautiful days. Ok, so I'm starting a beach adventure without a beach. Truth is Jen and I absolutely adore honey! We had to check this place out! The bloke running the show is madly passionate about honey, happy for a chat and very informative on the subject! Out the back there is a bee hive terrarium setup so you can see the busy bees doing there thing. 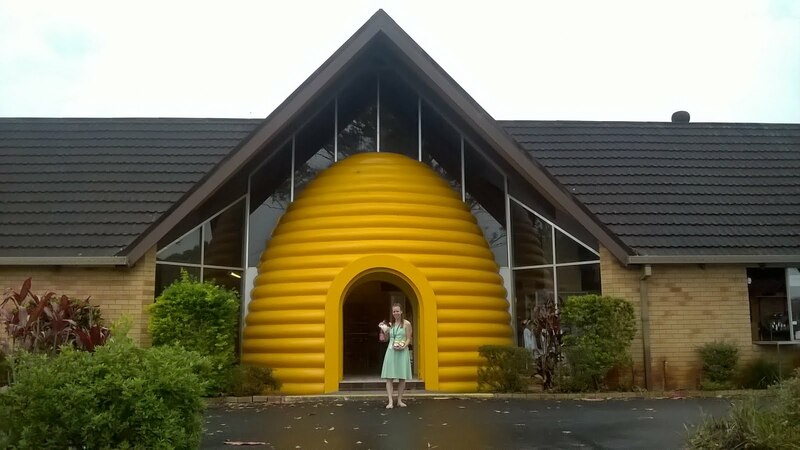 There's a little house out the back playing an old, but charming and informative documentary about bee's and honey. 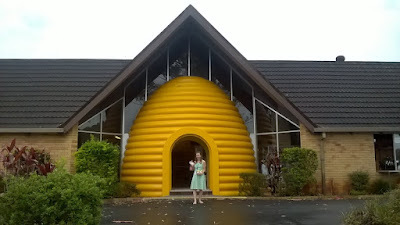 We really enjoyed our educational stint here, but we really love our honey. If you too love honey, check it out, the ginger honey is out of this world! Now for the beaches! This little gem was not far from the Pacific Highway north of Valla. Down the end of a road lined with a few large properties we found a dead end. We jumped out of Rocky to find a nice but obstructed view (image above on the left) overlooking a beach with what I assume is a lagoon blocking it off. Nearby we found a path so wondered down and found a gate to a train line, crossed the train line, through a bit of scrub and found a much nicer view (above right). It was quite cold while we were at Oyster Creek so we didn't swim across to the beach on this occasion, however we are keen to return on a warmer day and check it out a bit more! Valla is a place I would definitely like to get to know better. We stopped off at the beach on the south side of town, the sand was beautiful and clean and the town ensconced in National Park. During this particular trip the weather gods were not on our side, however upon our arrival to Valla the rain ceased. We had a bit of a walk about, then decided to stop for some lunch. While eating I notice something in the surf, a shark! Nope, not quite, it turned out to be a pod of dolphins. Never seen them so close to the shore on such a nice beach! Weather was too cold to jump in and swim with them, but we chased them from land across the beach as they rode the waves. They jumped, flipped and played around in a manner that made it obvious they were showing off to all the onlookers on the beach. All the onlookers being just Jeni and I! Didn't manage to capture a photo of the dolphins leaping out of the ocean, but was a memory Jeni and I will hold on to. As you make it over the hill into Scotts Head you are welcomed with a great view of the mountains to the north, it is no wonder this is a popular destination for holiday goers. Little Beach is a nice modest beach on the south and there is a much longer beach to the north by the caravan park. There is also a small walking track up the headland which has several lookouts to the south, east and north. Dogs are welcome on the beaches at Scotts Head making it a great destination for travellers with dogs. A modest little tourist destination. We walked through the caravan park which seemed quite nice and pretty quiet. We walked through an overgrown path to an old lookout viewing south then went for a small stroll along the beach that had a calm surf with lots of sea birds hanging out scoping the scene. Stuarts Point was teeming with activity, very busy destination and full of families and pets. 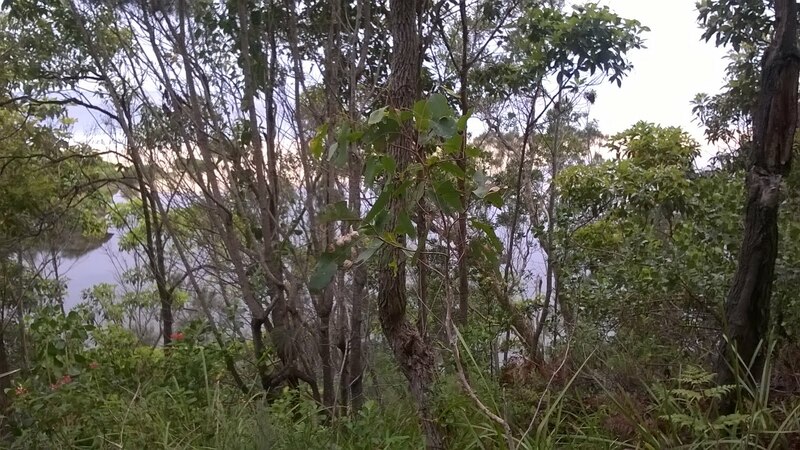 A large river sits between the town and the beach here, but access is just a short walk over a bridge then through a bit of bush. Once you reach the beach it is quite pretty, when we arrived though, we were greeted by a huge front coming up from the south west. We decided not to hang around the beach too long and get back to Rocky. The moment we arrived back at our troopy, so did the storm! Another popular tourist destination. The northern beach was teeming with activity, while the beach on the south side seemed a lot quieter. Great amenities. We stopped off at Arakoon predominately to check out the old gaol here. Sadly we missed the opening times, but had a stroll around the outside of the place to check it out. Quite a nice little area, camping is available and there are some nice coastal amenities were you could come down for a picnic. We also saw heaps of kangaroos hanging around the gaol and read the great story of Ghost Charlie, he'll chuck ya out of the tree says Auntie. Every good coast trip has to have at least one quick wonder around a lighthouse! These locations always give you a splendid view of the surrounding areas. Lighthouses are also vital for guiding ships around the coastline and without them we would not have had the setting for Around the Twist. They also provide fantastic windy photos.